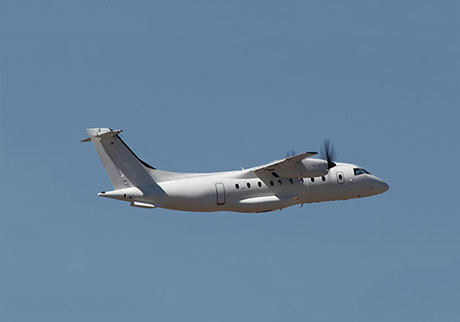 Last week the UK/Germany-based 328 Group announced that it had handed over the last of 17 Dornier 328 twin-turboprop transports to Sierra Nevada for supply to U.S. Special Operations Command (USSOCOM). The U.S. Air Force operates these aircraft as the C-146A Wolfhound. The handover ceremony for the last aircraft took place on July 9, but announcement was delayed, possibly owing to the sensitive nature of these aircraft. Following the handover at 328 Group’s facility at Oberpfaffenhofen in Germany, the aircraft departed for Sierra Nevada’s facility at Centennial, Colorado. All 17 aircraft were pre-owned airliners, with two being sourced directly by Sierra Nevada and the remainder by the 328 Group. Sierra Nevada awarded 328 Group a four-year contract worth more than $200 million to perform overhaul and upgrade work on the aircraft, as well as to provide spares support. The 328 Group holds the type certificate for the Dornier 328 in both its jet- and turboprop-powered versions, and provides global fleet support. Under the contract the 328 Group brought all 17 aircraft up to specification, a process that involved some 220,000 man-hours. Each aircraft underwent a six-month overhaul process that included engine and propeller checks. Flight decks were standardized across the 17-aircraft fleet, including some avionics upgrades. Mission-specific modifications included the addition of a gravel runway kit and high-frequency communications. Seven aircraft had a spoiler retrofit, while five of them were given auxiliary power units. Somewhat camera-shy, the aircraft wear a quasi-civilian blue-white scheme and carry just a five-digit serial number on the tail. They have been spotted in many parts of the globe, but mostly in Latin America, the Far East and Africa. One of them made an unwelcome appearance in local headlines in May this year when it was requested to land at Banda Aceh in Indonesia while en route from the Maldives to Singapore. Reports suggest that the aircraft was ordered to land as it did not have the correct overflight clearance, but also that it had requested to make an emergency landing as fuel reserves were low.